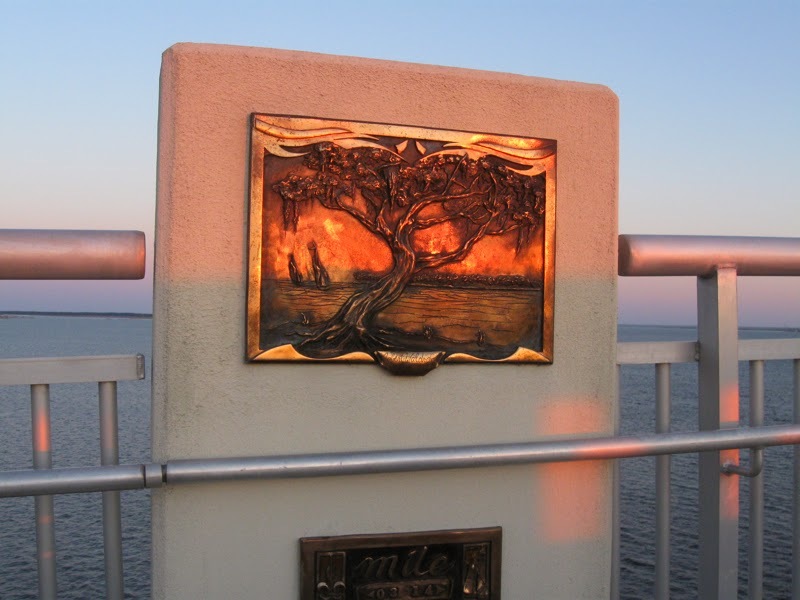 The past week’s sunny days have created opportunities for “bridge therapy.” Husband Walter and I arrived at the base of the Biloxi Bay Bridge's pedestrian lane about 10 minutes before sunset. That meant we had 10 minutes to make it the four- or five-tenths of a mile to the structure’s highest point and best vantage point for a sunset. Our town’s side of the bridge has the shortest—and steepest incline to the top. Hubby was reluctant to leave me alone walking at my slower pace while sharing the concrete surface with runners, cyclists, and parents pushing baby strollers up and down the steep manmade hill. During my final months of physical therapy, the therapist had evaluated progress in terms of my increased walking speed. That thought was good motivation to keep me pushing and puffing up the hill to an internal refrain of “I think I can. I think I can.” A timely and relevant literary allusion also has the power to inspire me. I made it to the bench that shares the 0.3-mile marker before the sun dipped into the bay. I took a seat on the bench and released Hubby from caregiver mode to continue on to the top without me. Catching my breath, I pulled out my little Canon to capture my own version of the sun’s fading rays in the photo above. The next day walking buddy Ann and I were on the bridge, climbing this ladder to the top. 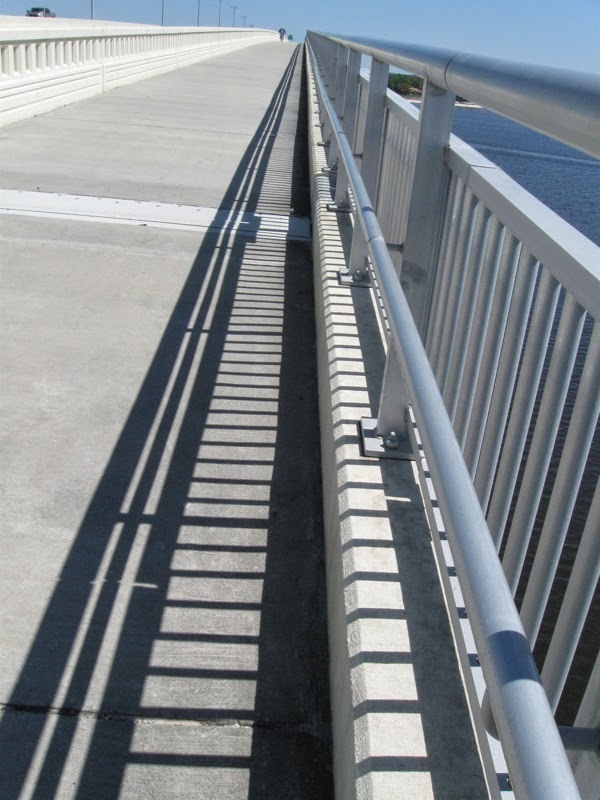 In addition to the release of endorphins that our bridge walking generates, there is always something visual to enjoy on the bridge, whether sun and shadow, birds, frisky marine life, or opportunities for people watching. May joys small and great fill your week. You are definitely the little engine that could! That evening light is lovely! A good motivation to walk. 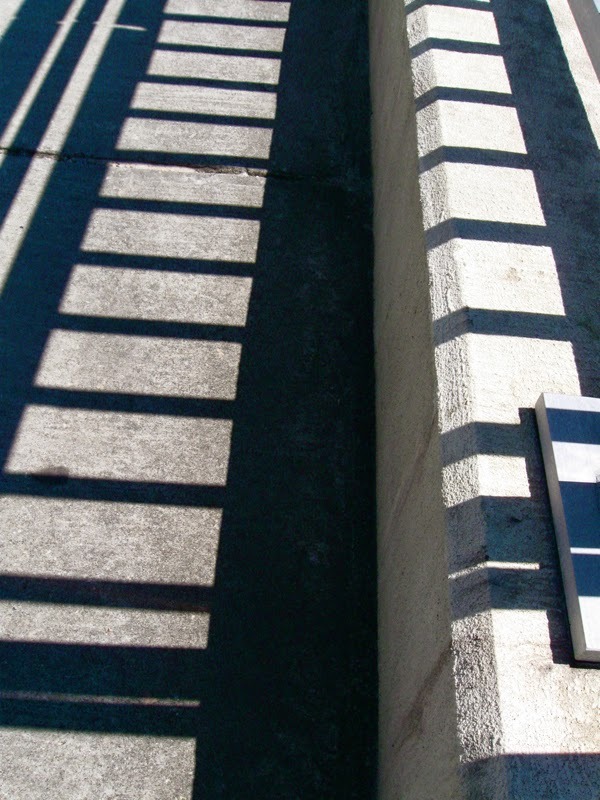 The shadow of the fence does indeed look just like a ladder. I am so glad the weather is better and you are out and about getting good exercise. You get more exercise than I do. I enjoy reading about your 'bridge therapy'. The photos make me wish I had such a place nearby, then perhaps I would be more motivated to walk! Instead, I'll have to settle for using a hoe in the garden, which isn't nearly as much fun! I need to send my aunt to your blog. She had a stroke 6 years ago and does not do much in the way of exercise. I think it's great that you put such effort into your recovery and know when you've had enough. Your photos are only exceeded in inspiration by your words. I loved these photos. You have such an eye. You also have an attitude and spirit that continues to inspire. Have a blessed Easter.